The first thing a good chef will tell you is to season, season, season. If we're going to season, why not look good doing it? We've put together a list of our current favorite products for shaking, grinding, and storing your salt and pepper. Stack ‘em, turn ‘em, don’t worry about spilling ‘em. Salt and pepper shakers have never been so fun. These geometric beech wood shakers are cleverly embedded with neodymium magnets to enhance their attraction—to each other. A swooping interlocking design makes for the most graceful salt and pepper shakers we've yet to discover. A contemporary sculpture in its own right, you'll want to leave this set on your tabletop for display all the time. These porcelain and cork salt and pepper shakers were named for the latitude where Denmark meets Norway, but designed for the dining table at the intersection of mashed potatoes and green beans. We like the unfussy shape, nice contrast of textures, and—best of all—very clear distinction between with spice is which. 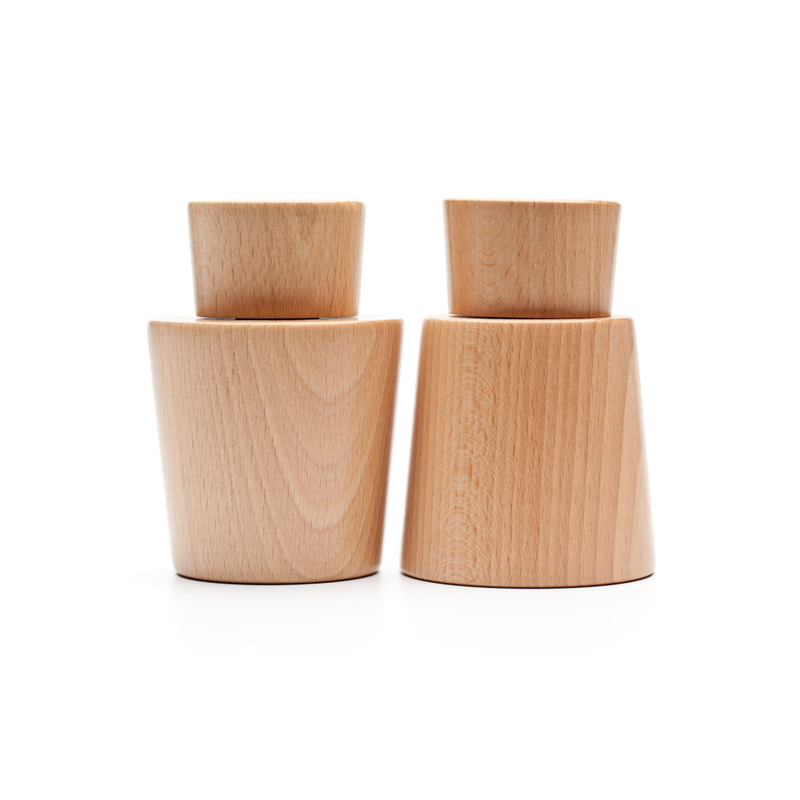 Domestic Aesthetic's recalimed wood Salt + Pepper Shakers will add some spice to any dining room table. This salt and pepper grinder set by Norm Architects' Jonas Bjerre-Poulsen and Kasper Ronn for Menu is especially smart, with a ceramic body and wooden top. But it gets better: this grinder isn't limited to just salt and pepper. The designers made it extra strong to accommodate the adventurous chef. "We wanted to take a big step away from the predictable salt and pepper thinking and instead encourage people to experiment with spices, kernels, seeds and all the other modern kitchen ingredients," says Bjerre-Poulsen. Not only are these attractive ceramic and stainless steel salt-and-pepper shakers stackable (which saves you some space), they are also dishwasher safe, which makes cleaning them a breeze. This salt and pepper grinder, designed by Norway Says for Muuto, is available in white, black, and natural beech wood, but our favorite is this playful multi-colored version. The stacked components reflect their use; the widest piece indicates where you grip the grinding mechanism; the tall section shows where the pepper and salt is stored. Designed with a stainless steel swivel top and an adjustable ceramic grinder, these salt and pepper mills deliver flavor in refined form. Their rubber and powder-covered aluminum base can be separated for easy cleaning. A set of two mini porcelain folded bowls for holding your salt and pepper. Glazed in clear gloss, these little recepticals are clean, simple, and chic. The olive wood used in these tabletop salt and pepper keepers is grown in a sustainably managed forest in France. We love the swiveling magnetic lid and the two-chambered design of the double-size version.